Sussex won their second Specsavers County Championship match of the season at Arundel when they defeated Durham by an innings and 64 runs - 12 minutes before the scheduled close of the third day. It was a deeply impressive performance by Sussex, with a spirited bowling and fielding performance building on the maiden century heroes of their solitary innings, Tom Haines and Phil Salt. But for Durham, who had caught the eye with their two championship successes this season, this was a disappointing performance from their young side. On a blameless pitch they lost seven wickets for 65 runs in the morning session and then, having followed on 341 runs behind, 95 for five in the afternoon session to leave their position hopeless. When Durham resumed on 202 for 4 the overnight pair of Will Smith (90) and Gareth Harte (12) were still nurturing hopes of avoiding the follow-on. On an unhelpful surface Sussex were hoping they would be able to make a breakthrough with the new ball, which would have been available six overs into the morning session. But they didn’t need the new ball. Durham collapsed, losing their last six wickets for just nine runs in 10.5 overs in only 43 minutes. Danny Briggs took the key wicket of Smith – lbw sweeping - with the fifth ball of the day. David Wiese then broke the innings with three wickets in seven deliveries. He bowled Stuart Poynter and then Josh Coughlin, shouldering arms, first ball. Then he had Nathan Rimmington caught down the leg-side in his next over and Durham had lost four wickets for one run. Harte, who had scored one run in half an hour as he watched miserably from the non-striker’s end, was caught behind off Briggs and, finally, Wiese bowled Matt Salisbury for eight. 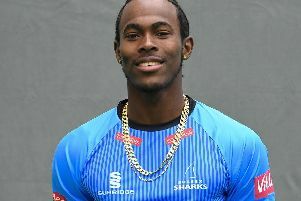 Sussex enforced the follow-on and in the fifth over Cameron Steel was bowled by a fine nip-backer from Jofra Archer when the batsman didn’t offer a stroke. Durham were unable to turn the tide. At 61, Tom Latham was bowled by Ollie Robinson through the gate when he might have been forward. At 77 Smith – again a most important wicket – was brilliantly caught by Harry Finch at wide second slip, low down and right-handed off Wiese. Four balls later Paul Collingwood, playing across one from the same bowler, was lbw and it was 88 for five when Harte was sharply caught down the leg-side by Ben Brown off Briggs, who then had Graham Clark lbw to make it 137 for six. A fighting 84 from Poynter, off 109 balls with 11 fours, ensured Sussex took the new ball. Robinson soon bowled Salisbury and Archer completed the match when he caught and bowled Rushworth.